Below you’ll find our suggestions for where to pick up cheese, sweets, wine and other picnic provisions before dining along the banks of the Canal Saint-Martin. Du Pain et Des Idées – Christophe Vasseur’s breads are worth crossing town for, and many people do. Excellent pastries and small stuffed savory breads called mini-pavé are picnic-perfect. El Nopal – Taco picnic! It’s north of the prime spots along the canal, but the extra leg work involved is worth it for legitimately spicy burritos, tacos, quesadillas and more. Veggie options available too. La Cantine de Quentin – This canal-side épicerie has tasty prepared foods, tempting products and bottles to go, too. 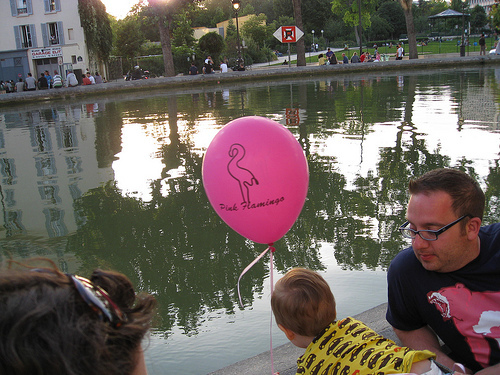 Pink Flamingo – “Pas comme les autres,” is the motto at kitschy cool Pink Flamingo Pizza. Take-out and delivery available at all locations. You’ll spot the pink balloons given to picnickers up and down the water for those who have their pies delivered to the canal. Jules et Shim – Truffaut film-inspired Korean takeaway. Lukewarm bibimbap is packed to-go for easy canalside snacking. They have a 4 person picnic prix fixe for 44 euros. Le Cambodge – You can order to-go containers where bobos go for bo bun. Go early or be ready to queue. Helmut Newcake – Thanks to this pastry shop, gluten-intolerant gourmandes can have their gateau and eat it, too.